There was an interesting article written by one Jeffrey Sachs, whose only notoriety, despite his own self-promotion, is that he was the principle promoter of the ridiculous doctrine of – Shock Therapy – which systematically ruined the nations it was applied to under the aegis of IMF structural reform. The latest article (January 6, 2015) – Paul Krugman has got it wrong on austerity – published by the UK Guardian, is a direct attack on Paul Krugman. I have no interest in defending Paul Krugman (nor would he be interested in such a defense). Rather, my interest is that Sach’s intervention is one of a growing number of articles that claim that austerity has worked! An extraordinary new historical revisionism is underway. The conservatives always try to rewrite history to suit themselves. This is the latest version of that long-standing exercise and deception. First, some background on Sachs. The term “shock policy” really originated with Milton Friedman who used the term “shock policy”. It was first applied to Chile by the so-called – Chicago Boys – who studied at the University of Chicago under Friedman and then went back to Chile to inflict their warped free market policies on their homeland. Of course, they first required the help of the CIA and the Chilean military to overthrow the democratically-elected Allende government and then brutalise the population (torturing and murdering dissenters who wanted respect for the democratic voice of the people) into submission. General Pinochet turned to the “Chicago Boys” … and appointed several of them to powerful positions in the government. [Reference: Friedman, M. and Friedman, R. (1998) Two Lucky People: Memoirs, University of Chicago Press, page 398]. Jeffrey Sachs then coined the term “Shock Therapy” in the mid-1980s, when he was hired to turn these mad ideas loose on Bolivia (1985), who were unable to meet the harsh debt repayment schedules demanded by the IMF. Buoyed by his ‘success’ in elevating unemployment rates to astronomical levels, Sachs then paraded as a paid consultant in Eastern Europe and Russia. He applied Shock Therapy to Poland in 1989 and later Russia. His shock therapy for Russia was a disaster and led to government price controls being abandoned and state enterprises being privatised. Not only did inflation rise quickly, but unemployment soared and individuals and households lost the savings that they had worked hard the years to build up. During the period he was consulting for the Russian government the health care and social services system collapsed, life expectancy went backwards (which was unprecedented for an advanced nation), real GDP fell by around 50 per cent and poverty rates increased by a factor of 10. In relative terms, the economic losses alone in the post-Soviet economies that embraced the Shock Therapy path were more than twice as large as the losses in America and Western Europe during the Great Depression. Given the bias of the western media it is no surprise that we really don’t understand how bad things became in Russia and the satellites after the fall of the Soviet system and the introduction of Sach’s-style therapy. In the last decade I have done some work in Kazakhstan (through the Asian Development Bank) and the situation there after 15 odd years of neo-liberal free market therapy of the type Sachs endorsed was abysmal. Fortunately the old Soviet satellites are now trying to change course and are seeing the value of government-led growth strategies. So Jeffrey Sachs does not have a great record for sound judgement when it comes to appraising the plight of a nation or the appropriateness of macroeconomic policies. Interestingly, here is Jeffrey Sach’s own account (March 14, 2012) – What I did in Russia. Egregious at best. During his Shock Therapy days, he claimed that his approach was providing a long-run solution and that poor short-term outcomes were to be expected. The problem is that the long-run is just a sequence of short-runs and shock therapy meant that a vast number of older members of the population, who had worked all their lives to achieve a modest, but secure, standard of living now faced poverty in the midst of lost pension schemes, market-based rents and rising unemployment. It also leads to the potential growth path falling because investment suffers as a result of the depression that is caused. This sort of policy shock was applied in many countries once the Soviet system fell with similar, disastrous, results. Interestingly, while Shock Therapy was an early and harsh example of the growing neo-liberal policy influence in the 1980s and 1990s, Sachs now parades as a progressive. In relation to the subject matter of today’s blog, I considered an article written by Jeffrey Sachs for the Financial Times (June 7, 2010) in this blog – Who should be sac(k)ed? 1. People like Paul Krugman have been railing against austerity and saying the austerity would entrench high unemployment. The federal budget deficit declined from 8.4% of GDP in 2011 to a predicted 2.9% of GDP for 2014. According to the International Monetary Fund, the structural deficit – sometimes called the “full-employment deficit”, and a measure of fiscal stimulus – fell from 7.8% of potential GDP to 4% from 2011 to 2014. Yes, as an historical fact, the fiscal deficit fell in the US. 3. But “rather than a new recession or an ongoing depression, the US unemployment rate fell from 8.6% in November 2011 to 5.8% in November 2014. Real economic growth in 2011 stood at 1.6%, and the IMF expects it to be 2.2% for 2014 as a whole”. Yes, as an historical fact, economic growth continued in the US and unemployment fell. The quality of the employment created in terms of job security, productivity and real wage levels is, of course, highly questionable. But that is an aside. The point is that Krugman is alleged to have said the growth could not have occurred. 4. Sachs then concludes that the coincidence of fiscal deficit falling and growth continuing proves that austerity works and economists such as Krugman were completely wrong. The conclusion then is that progressives should get over their opposition to austerity – Sachs now being a self-proclaimed progressive! Because, apparently, Krugman conflated “two distinct ideas as if both were components of “progressive” thinking”. Which ideas? 1. “rightly focusing on how government can combat poverty, poor health, environmental degradation, rising inequality and other social ills”. There is nothing progressive about large budget deficits and a rising debt-to-GDP ratio. After all, large deficits have no reliable effect on reducing unemployment, and deficit reduction can be consistent with falling unemployment. … we should pay for this through higher taxes on high incomes and high net worth, a carbon tax, and future tolls collected on new infrastructure. We need the liberal conscience, but without the chronic budget deficits. So neo-liberal, mainstream economics is now progressive when it is expressed by Sachs! The problem with his narrative is that it implicitly buys into standard neo-liberal view of fiscal parameters and confuses the inherent causality between the aggregates. As background, you might like to read this blog – A voice from the past – budget deficits are neither good nor bad. But at any point in time, we can conclude whether a fiscal deficit is good or bad? How come? Remember that the fiscal balance is the difference between Revenue and Spending. So when employment is falling, the revenue the government gets from taxation falls because people are not earning income. In other words, without any discretionary policy changes, the fiscal balance will vary in a pro-cyclical (with the cycle) manner over the course of the economic cycle. When the economy is weak – tax revenue falls and welfare payments rise and so the fiscal balance moves towards deficit (or an increasing deficit). When the economy is stronger – tax revenue rises and welfare payments fall and the fiscal balance becomes increasingly positive. Automatic stabilisers attenuate the amplitude in the business cycle by expanding the budget in a recession and contracting it in a boom. So just because the fiscal balance goes into deficit doesn’t allow us to conclude that the Government has suddenly become of an expansionary mind. Governments that impose fiscal austerity with the sole aim of reducing their fiscal balance outcome (and related public debt aggregates) may cause economic growth to falter which in turn undermines their tax revenue. The upshot is that the fiscal balance moves further into deficit or doesn’t move into surplus as planned which then triggers further mindless cutting of net spending. So trying to work out whether it is the strength of the cycle that is driving the fiscal outcome or the fiscal decisions of government that is driving the cycle at any point in time is difficult. Further, we also have to measure the automatic stabiliser impact against some benchmark or ‘full capacity’ or potential level of output, so that we can decompose the fiscal balance into that component which is due to specific discretionary fiscal policy choices made by the government and that which arises because the cycle takes the economy away from the potential level of output. This decomposition provides (in modern terminology) the structural (discretionary) and cyclical fiscal balances. The fiscal balance components are adjusted to what they would be at the potential or full capacity level of output. If the fiscal balance is in deficit when computed at the ‘full employment’ or potential output level, then we call this a structural deficit and it means that the overall impact of discretionary fiscal policy is expansionary irrespective of what the actual budget outcome is presently. If it is in surplus, then we have a structural surplus and it means that the overall impact of discretionary fiscal policy is contractionary irrespective of what the actual fiscal outcome is presently. So you could have a downturn which drives the fiscal balance into a deficit but the underlying structural position could be contractionary (that is, a surplus). And vice versa. The difference between the actual fiscal outcome and the structural component is then considered to be the cyclical fiscal outcome and it arises because the economy is deviating from its potential output level. I consider that aspiration to be a primary aim of progressives (among other pursuits). 1. Maintain full employment by ensuring there is no spending gap which means that the necessary deficit is defined by this political goal. It will be whatever is required to close the spending gap. 2. It is also possible that the political goals may be to maintain some slack in the economy (persistent unemployment and underemployment) which means that the government deficit will be somewhat smaller and perhaps even, for a time, a fiscal surplus will be possible. But the second option would introduce fiscal drag (deflationary forces) into the economy which will ultimately cause firms to reduce production and income and drive the fiscal balance towards increasing deficits. But at that point, the economy will support lower employment levels and rising unemployment. The fiscal balance will also be in deficit – but in this situation, the deficits will be what I call bad deficits. Bad deficits are those that are driven by a declining economy and rising unemployment. It follows that a good deficit is whatever is necessary to fill the spending gap. The concept of fiscal sustainability developed within Modern Monetary Theory (MMT) doesn’t focus on a particular deficit outcome, in the way that Sachs thinks we should, but rather requires that the government fills the spending gap with good deficits at levels of economic activity consistent with full employment. While Sachs might now aspire to advancing public infrastructure, spending on education, and investing in public research to advance renewable energy, there is no guarantee that these ‘progressive’ goals can be achieved with a balanced budget as he claims. The fiscal position necessary to achieve these goals could be a small (large) surplus, a balance, or a small (large) deficit. It all depends. A progressive fiscal position does not eulogise a large deficit per se as he claims. Rather, it declares the actual focus on the deficit outcome to be irrelevant. What matters is the state of the society and the way in which the government through its fiscal position can support progressive aims, given the spending decisions of the private domestic and external sectors. Those non-government decisions, outside (but somewhat influenced by government policy), effectively determine how large or small the deficit has to be to achieve the policy aims. The focus should be on achieving progressive aims not the deficit. The other way that Sachs confuses the causality is as follows. In effect, the discretionary decisions of government to expand net spending can drive economic growth, which not only leads to a reduction in the fiscal balance via the growing tax revenue but also would see the deficit to GDP ratio fall. The ratio falls for two reasons. First, because the deficit itself is falling in absolute dollar terms (that is, the numerator of the ratio falls). Second, because GDP increases as the stimulus takes effect (that is, the denominator of the ratio rises). One can easily see that in the case of the US, the fall in the fiscal deficit to GDP ratio began with the denominator effect as the stimulus through to the middle of 2009 and then reintroduced in early 2010 and 2011, helped private spending recover. As private spending recovered somewhat, the fiscal position was tightened slowly but by then the growth in GDP was established and the outstanding fiscal deficit was sufficient to sustain that growth. 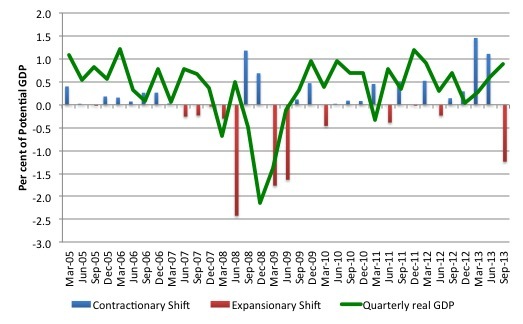 The following graph provides a relatively simple view of the quarterly fiscal shifts in the US since the March-quarter 2005. The data is from the – Congressional Budget Office. The fiscal shift is calculated in terms of percentage of GDP changes in the structural balance each quarter. So a positive bar (blue) indicates the structural balance (as measured by the CBO) is falling and a red bar indicates the government is expanding its structural balance. The green line is quarterly real GDP growth. Note that the CBOs measure of the structural balance is biased to overestimating the discretionary deficit and underestimating the cyclical effect. It admits to that in their document – The Effects of Automatic Stabilizers on the Federal Budget as of 2013 – under the heading “Why Do Budget Deficits Appear Cyclical Even After the Estimated Effects of Automatic Stabilizers Are Filtered Out?”. Please read my blog – The confidence tricksters in the economics profession – for more discussion on this point. But given that the graph still shows how the discretionary fiscal position in terms of timing of the changes can hardly be said to an example of austerity driving growth. The larger fiscal contractions can once overall growth was well-established. 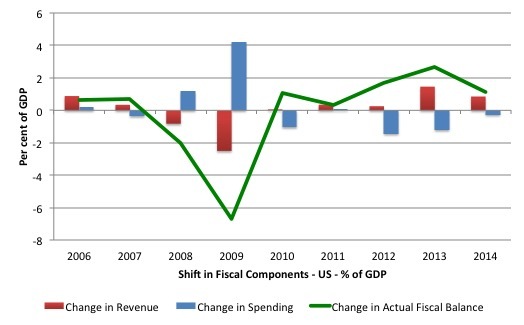 Further, the next graph shows the changes in the fiscal components between 2006 and 2014 in terms of percent of GDP shifts in the total balance (green line), total spending (blue bars) and total revenue (red bars). The sharp growth in the deficit in 2008 and 2009 was a combination of a dramatic decline in revenue (0.8 per cent of GDP in 2008 and 2.5 per cent of GDP in 2009) and the growing fiscal stimulus (mostly discretionary) in 2009 (4.1 per cent of GDP). That shift stimulated economic growth as the earlier graph shows. then the big contraction in the fiscal balance in 2013 was driven by a significant increase in tax revenue (1.4 per cent of GDP) and a lesser reduction in spending (1.2 per cent of GDP). And, finally, while Krugman was forecasting significant austerity in the US, he clearly underestimated the degree of incompetence among the Congresssional players. While they talked big about austerity, the reality was very different and the US has enjoyed on-going fiscal support (though diminishing) well beyond the turning point in the cycle. Sachs’ article is a classic example of the new historical revisionism is underway. There are many thousands of people who have been victim of Shock Therapy in the past. Now millions are being brainwashed into believing that the austerity was a success and stimulated growth. In terms of good and bad spending I was wondering whether public liability insurance is an example of bad spending because it is essentially concentrating money back into an insurance/finance sector rather than using it directly in the economy, this makes it a kind of tax on all community activity. I recently attended a meeting of people who volunteer to help aged people. An insurance representative presented a talk where he said that yes they all need PLI, but that they also should get product liability insurance in case someone hurts themselves on the staple of a brochure, and personal liability insurance to cover people falling off ladders. This to a room of people trying to do their best to get together and to help other people in practical ways. ie it is a real constriction of our community capacity to be bound into this kind of financial prerequisite for all activity. One person said their group was breaking up. I wonder if the same problem is likely with the NDIS if money is being withdrawn from direct help for disabled people and services in the community and put into an insurance scheme. Does this not spend it in a way which disconnects it from community and puts it into a kind of tax like PLI? Perhaps I misunderstand its purpose. Bill is right. Jeffrey Sachs is a twit. That man has a lot of blood on his hands. I hope for his own sake that there is no Hell. I know of no other single economist responsible for such a large amount of human suffering and geopolitical turmoil. His answer consists of a chart which plots growth against “Change in real government purchases” for about 30 countries. The two are clearly positively related on the chart, which supports Keynsianism, sort of. But shouldn’t he have plotted growth against the deficit for each country? It’s primarily DEFICITS which promote growth in a recession, rather than “government purchases”. I.e. if the latter are fully covered by increased tax, there won’t be much of deficit / growth effect. “The other way that Sachs confuses the causality is as follows. In effect, the discretionary decisions of government to expand net spending can drive economic growth, which not only leads to a reduction in the fiscal balance via the growing tax revenue but also would see the deficit to GDP ratio fall. I am confused with the explanation in the above quote from the article. For the above ratio to fall would not the denominator ‘rise’? Is this a typo or am I missing something? Yes, a typo. I appreciate the scrutiny. Fixed now. Despite his umblemished record of destructive failure, he still finds people willing to publish his opinions. … he still finds people willing to publish his opinions. Some people make a lot of money when other people lose a lot of money. Sachs need only look to the former group for support of his publishing efforts. Good to see you responding to Sachs, Bill. Might this post/graph from Ed Dolan at EconoMonitor also be relevant here? And thanks again for your prolific writing about MMT. It’s been a big help for me and, I’m sure, many others. [His policies were] … responsible for the deaths of hundreds of thousands who committed suicide in Russia in the 90s as a result of what he did. I can’t remember the name of the documentary (was it an Adam Curtis film? ), but there was an utterly heart-breaking shot of an older woman sitting in an official’s office sobbing uncontrollably that she had no money to buy food, and the official didn’t have any to give her. Sachs had kicked the safety net out from underneath all of them. In the same flick, there was a shot of Sachs being driven around NYC pontificating in the backseat about how he and Clinton were saving and reinventing Russia. He had privatized the national companies overnight and handed out shares to everyone so they could become entrepeneurs; people were selling their 50 bucks worth of shares on the street for pennies to get any $ for food. That’s how the oligarchs grabbed everything. These two scenes are etched in my mind, and I still feel for that older woman everytime I think of her. Dr. Mitchell…. I understand and totally agree with you regarding full employment. What concerns me is the generally held belief that we can only achieve “full employment” via deficit spending…I just think there are other ways to get there that are deficit-neutral…which is not to say you disagree. For several years I have been urging the powers that be in the U.S. to enact The Neighbor-To-Neighbor Job Creation Act [hereafter NTN]—the following is a quote from a letter to President Obama/Council of Economic Advisers, to define “A federally mandated Social Insurance, owned by our employed, to provide a fund to hire/train our unemployed. For a modest 4% of salary policy cost NTN will create more “private-sector” jobs in 6 months than our current path, HR 2847, in 6 years [jobs beget jobs].” Another deficit-neutral path to full employment in the U.S. is HR 1000. The error in thinking by the leaders throughout the OECD [and explains their pervasive high unemployment], is the belief that “the market can provide anybody wanting a job, with a job”—this is not supported by the data, and in the U.S., with this belief driving our policies, our unemployment has not fallen below 3% since 1953—leaving millions jobless in the interim. 3% is the zero-sum threshold above which unemployment triggers: Inflation by diminishing labor training and skills, under-utilizing capital resources, reducing the rate of productivity advance, increasing unit labor costs, reducing the general supply of goods and services–and the loss in income to the Market is compounded exponentially with each percentage point of increase in unemployment, above 3%. Or this is the way I see it…. Another typo – missing “not”? A progressive fiscal position does eulogise a large deficit per se as he claims. I had fixed that typo last night. Perhaps you are reading a cached version of the blog. But thanks for the scrutiny. Ralph, ‘twit’ is being too kind to Sachs. He is the most deplorable, disgusting excuse for a human being currently passing as a progressive. If he is a progressive, I am Santa Claus. He was on UK’s Newsnight program recently, and I have never seen a more repulsively arrogantly contemptuous individual in my life. Krugman is arrogant, but he at least treats those who disagree with him with a modicum of respect, which he did with some moronic Tories on a different Newsnight program. Not Sachs. Not even in a TV studio. Even for brainwashing purposes, surely someone less odious for this ‘job’ could be found. What is inexplicable is that his obvious personal flaws do not appear to have the effect on those he interacts with that one might, in general, expect. It depends what you mean by “responsible” but Marx is arguably the cause of orders of magnitude more human suffering and geopolitical turmoil than Sachs. If Marx had kept himself to himself, everything would have been OK.
You’re right about a lot of rewriting of history going on here by Sachs, but not to the ludicrous degree that Standpoint link by postkey does. I’m old enough to particularly resent its bit, reflecting Tory conventional wisdom, about that 1981 letter by 364 economists to Thatcher decrying austerity. The letter said that tightening the Budget in 1981 would lead to a deep recession that would cause a large overhang of unemployment for years in the UK. For the record, that is EXACTLY what happened. Have we forgotten “Maggie’s millions”? an interesting dispute, but what really shines through is not the specifics of the dispute, it is the fact that such a dispute occurs at all. when eminent economists disagree to such an extent that they can’t even agree on what the relevant facts are, it exposes the limits of economic theory as a policy tool. how should a policy maker evaluate disparate economic policy ideas under these circumstances? should they take the risk that, e.g., krugman is right despite the strong critiques of his view from all points on the political spectrum? what sachs, krugman and many others have really accomplished is to put on full, ugly display the sheer irrelevance of most macroeconomic theory where it really matters.